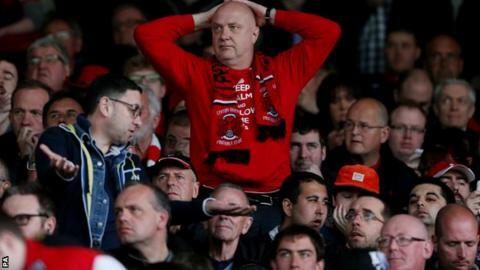 Leyton Orient's final-day efforts were all in vain as a point was not enough to keep them in League One. Lloyd James's 20th-minute penalty was saved by Cameron Belford, after his brother Tyrell, who started in goal for Town, had been sent off for the foul. But Dean Cox lifted them out of the relegation zone when he put them ahead. Chris Dagnall doubled the lead but Anton Rodgers pulled one back and Andy Williams earned a point for Swindon with a late penalty. Leyton Orient were nearly promoted to the Championship last season when they missed out on automatic promotion and then lost the play-off final to Rotherham in a penalty shoot-out. But they are now back in League Two for the first time since 2006. The missed penalty did not put off the visitors, who went ahead shortly afterwards when Cox robbed Raphael Rossi Branco to give them hope. That lead increased when Dagnall doubled the lead with a neat finish soon after the break. But a much-changed Swindon, who face Sheffield United in the League One play-offs, did rally and were back in the match when Rodgers, son of Liverpool manager Brendan, scored. And Williams' 86th-minute penalty, after a foul on Sam Ricketts, completed their comeback. It mattered little, as even a win would not have been enough to save Leyton Orient after Colchester's home win over Preston. Match ends, Swindon Town 2, Leyton Orient 2. Second Half ends, Swindon Town 2, Leyton Orient 2. Corner, Leyton Orient. Conceded by Sam Ricketts. Attempt missed. Raphael Rossi Branco (Swindon Town) right footed shot from the right side of the box is close, but misses to the right. Andy Williams (Swindon Town) wins a free kick in the defensive half. Foul by Mathieu Baudry (Leyton Orient). Attempt blocked. Josh Wright (Leyton Orient) right footed shot from outside the box is blocked. Corner, Leyton Orient. Conceded by Jack Barthram. Attempt missed. Josh Wright (Leyton Orient) header from the centre of the box is just a bit too high. Goal! Swindon Town 2, Leyton Orient 2. Andy Williams (Swindon Town) converts the penalty with a right footed shot to the top left corner. Penalty Swindon Town. Sam Ricketts draws a foul in the penalty area. Penalty conceded by Luke O'Neill (Leyton Orient) after a foul in the penalty area. Will Randall-Hurran (Swindon Town) wins a free kick in the defensive half. Foul by Luke O'Neill (Leyton Orient). Substitution, Leyton Orient. Scott Cuthbert replaces Dean Cox. Attempt missed. John Swift (Swindon Town) right footed shot from the right side of the box is close, but misses to the right. Attempt missed. Andy Williams (Swindon Town) right footed shot from outside the box is just a bit too high. Foul by Nathan Clarke (Leyton Orient). Attempt missed. John Swift (Swindon Town) right footed shot from the left side of the six yard box is close, but misses to the right. Substitution, Leyton Orient. Jobi McAnuff replaces Jay Simpson. Will Randall-Hurran (Swindon Town) wins a free kick on the left wing. Attempt missed. Will Randall-Hurran (Swindon Town) left footed shot from the left side of the box is close, but misses to the right. Foul by John Swift (Swindon Town). Andy Williams (Swindon Town) is shown the yellow card. Attempt missed. Andy Williams (Swindon Town) right footed shot from the left side of the box is close, but misses to the right. Corner, Leyton Orient. Conceded by Raphael Rossi Branco. Jack Stephens (Swindon Town) is shown the yellow card. Attempt saved. Andy Williams (Swindon Town) right footed shot from outside the box is saved in the bottom right corner. Substitution, Swindon Town. Lee Marshall replaces Harry Agombar. Goal! Swindon Town 1, Leyton Orient 2. Anton Rodgers (Swindon Town) right footed shot from outside the box to the top right corner. Mathieu Baudry (Leyton Orient) is shown the yellow card. John Swift (Swindon Town) wins a free kick in the defensive half. Harry Agombar (Swindon Town) wins a free kick in the attacking half.